Today's blog is the final installment of a four-part series on a conference I attended on literacy in the elementary and middle grades, hosted by faculty from Columbia University’s Teachers College. Through lectures, readings, discussions, and collaborative group work, I learned a great deal about the implications of current research on literacy assessment and instruction. Check out my prior posts on phonics, vocabulary, and reading comprehension. Teaching writing can be one of the most challenging and rewarding aspects of literacy instruction. Writing is an enormously demanding activity. To do it well, students must be able to generate and organize ideas, form grammatical sentences using appropriate vocabulary, and combine motor skills with their memories about letter formation, word spellings, and written mechanics. The benefits of writing make it worth the trouble, however. Written work gives students the opportunity to solidify thoughts about material they’re learning. Writing can also make students better readers by acquainting them with different kinds of texts and structures. And research indicates that sharing personal experiences through venues like written narratives benefits students psychologically and physiologically. Students must have experience writing with different purposes. The ubiquitous five-paragraph essay is certainly a useful format through which to refine analytical thinking. But developing writers need to hone their ideation and language use through other formats, too. Students should experiment with the kind of language used to describe, narrate, inform, and persuade/analyze. Studies show that the most effective writing instruction gives students the chance to write across genres, as well. Younger students should begin to experiment with persuasive pieces, analytical essays, informative texts, and reflective journal entries. And older students need to continue expressing themselves through poems, stories, and other creative formats. Writing instruction works best when it takes place beyond the language arts classroom. Content area teachers should give students the chance to write in forms fitting different subjects, whether this takes the form of lab reports in science, papers comparing and contrasting different systems of government in civics, or an explanatory paragraph justifying the answer to a math problem. There are numerous ways to teach writing well and no single strategy works best for every developing writer. However, research indicates that the best instruction teaches flexible strategy use. Students need to understand which strategies to use for various types of writing, and they need to be able to choose independently which ones to use. Optimal writing instruction also goes beyond the planning stage. 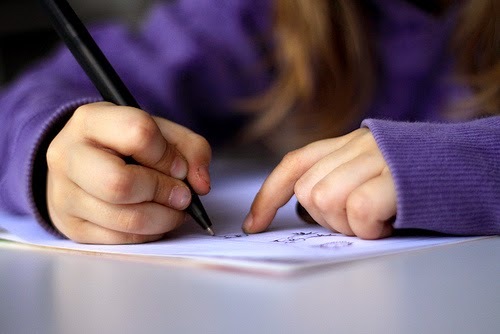 Many students have the experience of planning a piece of writing by generating a diagram or an outline first. However, some kids aren’t ready to move directly from this plan to the first draft. Teachers often observe that students fail to refer back to their plan when writing; this may be because they’re not sure how to use it to assist them. Good instructors help students use the plan they generate to scaffold their first draft. But the completion of the first draft is not the end of the writing process. Many students don’t know the difference between these two terms. The best way to polish papers may be to approach the proofreading process in two stages. First, students should revise by reviewing the content of their work. They should make sure what they’ve written accurately reflects their ideas and that their organization is effective. They should be certain that their writing isn’t repetitive and consider their word choices. Editing, the process used to find and fix mechanical errors, should take place only after students complete the revision process. When editing, students should look for mechanical errors (like spelling and punctuation mistakes) and make certain they haven’t written any fragments or run-on sentences. At the Yellin Center, we have found that a two-part checklist works well to facilitate this review process. Students should read through their work once with a revision checklist, then read it again using the editing checklist. And students need to know that the best writers—even professionals!—often reread their work multiple times over many days to give themselves a more objective perspective.